Reading with Rescues is a program that we created and kicked off at our Kids’ Camp in June of 2016. We love facilitating a learning atmosphere at our camps, and this program involves the animals, too! It’s not only an educational time for the children – it is truly therapeutic for our rescued animals. Children often bring out a different side of horses going through rehabilitation at our farm, and the rhythmic sound of a child reading can be comforting and soothing to our animals. It is also a great opportunity to socialize them as they wait to be adopted! Gummi is a 29 year old permanent resident. When she arrived at HHF, the vet did not know if she would pull through. She did! When there are children at the farm, she lights up and gives them her undivided attention. It’s beautiful to see! 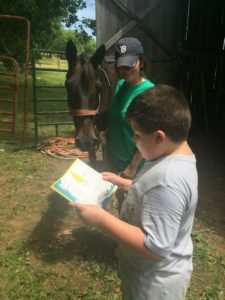 We are advocates of literacy and education – the farm is the perfect place to provide a unique reading experience for children! This program promotes reading as well as teaches important literacy skills using Equine Assisted Learning and tutors. This program was developed by highly-qualified reading/language teachers as well as volunteers with extensive equine experience. There are two functions of this program: A tutoring function and a recreational function. Some sessions of Reading with Rescues are designed specifically for tutoring purposes depending on the needs of the reader. Animals often offer a comforting and supportive environment that encourages children to read. Children are able to relax and read without any judgement! This program also encourages children to learn and use new vocabulary discovered while reading a story to an animal. Children are motivated to read and encouraged to discover a love of reading! We hope to inspire children to be life-long readers with this program! ALL VOLUNTEERS WITH THIS PROGRAM WILL BE BACKGROUND CHECKED. Our model consists of one “Equine Handler,” one “Tutoring Specialist,” the horse, and the child/reader. Equine Handler: The “Equine Handler” is a horse experienced, trained, volunteer that handles the horse during the Reading with Rescues session. Our Equine Handlers are specifically trained for handling horses for this program. They are familiar with all aspects of managing horses from the ground and are trained to properly handle the horse and protect the Tutoring Specialist and the child should any situation occur. Tutoring Specialist: The Tutoring Specialist does not handle the horse. Their focus is the reader. All of our tutors go through our Equine Volunteer Training as well as our Reading with Rescues Volunteer Training. They are mentored by highly qualified, certified teachers as well. The Horse: The horse brings a unique aspect to our program. Our readers will build their vocabulary and literacy skills by practicing their reading with one of our rescued animals. These horses may be fully rehabbed permanent farm residents or rehabilitated rescues seeking adoptable homes. The Child/Reader: This is what our entire program is about – The Child or Reader. The program is focused on promoting reading and literacy by allowing the Reader to engage in Equine Assisted Learning. Reading with Rescues takes place on our farm, and the Reader will learn in a unique, relaxed, learning environment. We are able to offer this program at no cost currently; however, we do appreciate donations for each Reading with Rescues session attended. Through generous private donors such as yourself, we are able to continue offering such programs. If you would like to contact us or learn more about this program, please email info@hickoryhillfarmtn.org.